The president blamed the cancellation on the Obama administration. President Donald Trump announced the sudden cancellation of a planned trip to cut the ribbon at the new U.S. Embassy in London late Thursday, blaming the reversal on the Obama administration's decision to sell the country's old embassy for "peanuts." Trump had been scheduled to attend a ribbon-cutting ceremony for the new U.S. Embassy in Britain next month. But Thursday night, just minutes before midnight, he tweeted he would not be attending, saying, "Wanted me to cut ribbon-NO!" 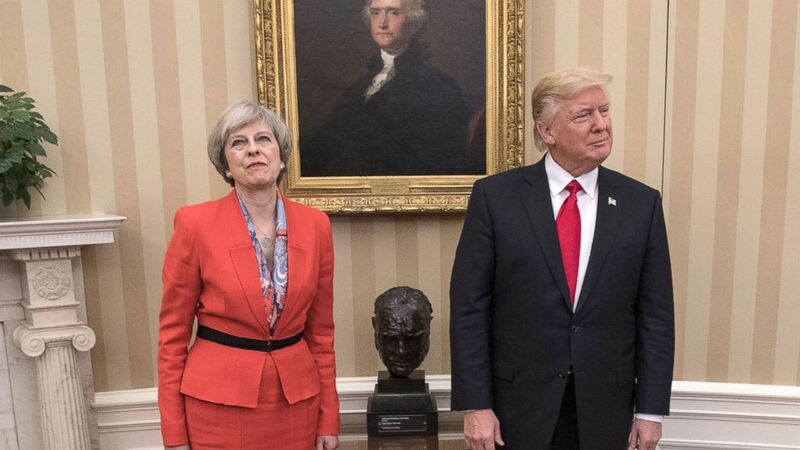 U.K. Prime Minister Theresa May invited Trump to visit the country during her stop at the White House in late January. She was the first foreign leader to visit the newly inaugurated Trump. May spoke to ABC News' George Stephanopoulos in September and said the visit was still planned and they were just "sorting out the logistics." A full-scale visit from Trump -- one at the invite of Queen Elizabeth -- was expected to bring protests of the U.S. president in London, but May told ABC News that was not the reason for the delay. The February trip to cut the ribbon at the embassy was expected to be scaled down. London Mayor Sadiq Khan, a frequent sparring opponent for Trump, echoed that protests were the real reason Trump cancelled the visit. "It appears that President Trump got the message from the many Londoners who love and admire America and Americans but find his policies and actions the polar opposite of our city’s values of inclusion, diversity and tolerance," Khan said in a statement early Friday. "His visit next month would without doubt have been met by mass peaceful protests. "Let’s hope that Donald Trump also revisits the pursuit of his divisive agenda," Khan added. Trump told reporters in July at the G-20 summit he would be visiting London eventually. “We'll work that out. We will be going to London. We'll be going to London,” Trump told reporters. (Christopher Furlong/Getty Images) British Prime Minister Theresa May is pictured with President Donald Trump at The White House on Jan. 27, 2017 in Washington. The sale of the old embassy actually began under the George W. Bush administration. They announced in an Oct. 2, 2008 release -- a month before Barack Obama's election to his first term -- that the U.S. had entered into an agreement with real estate company Ballymore to acquire the new embassy site in southwest London and that the old site "will be offered for sale almost immediately." The sale to Qatari real estate developer Qatari Diar was completed after Obama became president in November 2009, according to The Telegraph. The U.S. Embassy in London is funded entirely from proceeds of sale from other U.S. government property in London, according to the State Department. The State Department examined options for a costly renovation of the embassy in 2006, but that would have required an appropriation of taxpayer dollars and would not have met the most critical security needs. Ground on the new embassy wasn't broken until 2013. U.S. Ambassador to the U.K. Woody Johnson had tweeted just last week about the ceremony lowering the flag at the old Grosvenor Square embassy in London. Last month, Johnson, most known to Americans as the owner of the New York Jets, held a press conference and ABC News interviewed him one-on-one. He outlined what a good deal the new embassy was and said the new embassy was representative of a stronger and better U.S.-U.K. relationship. "When you look out through the window it reflects the global outlook of the U.S. in the 21st century," Johnson said. "It's a signal to the world that this relationship will get stronger and get better. ... I'm going to do that if I can. Drop the if I can. We're going to make it stronger."